Comments: Beryl Bowers (Nee: Bigler) | Nephi UT United States | 1941-1960 | Comments: The Salt Creek Camp of the Daughters of the Utah Pioneers standing on the steps of the Utah territorial statehouse in Fillmore, Utah (believed to be in the late 1940's or early 1950's). Christena Sinclair Bowers is in the black dress standing at left. 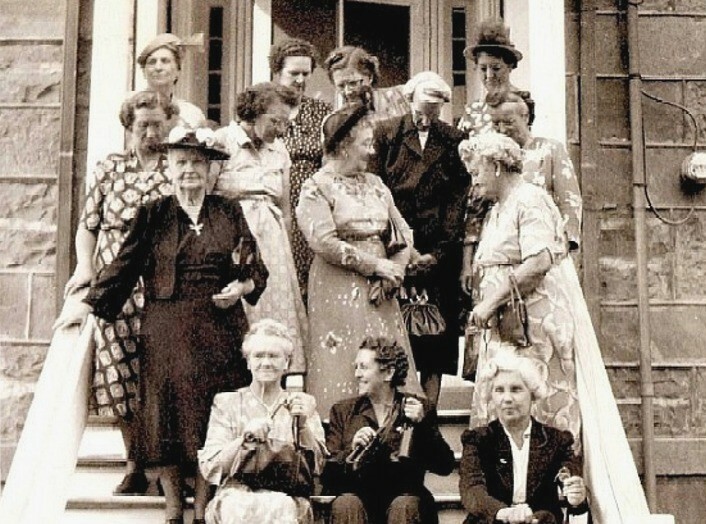 Beryl Bigler Bowers is standing in the center, and Maude Bowers Robertson is standing in the right rear with her face partially obscured. Can anyone identify these other women?